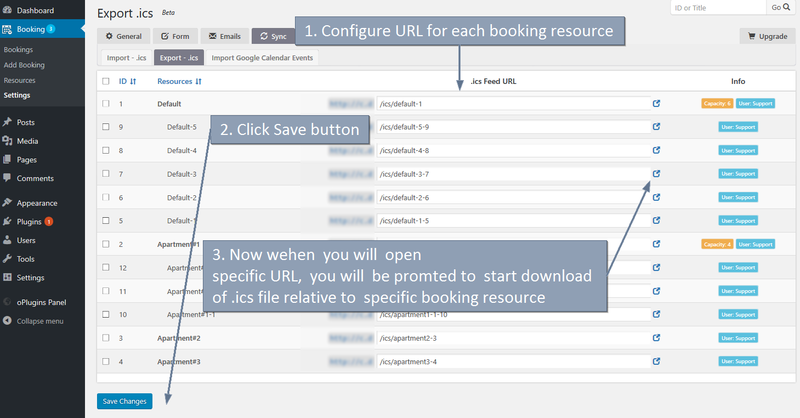 FAQ > Sync > How to start export of bookings in .ics feeds from Booking Calendar ? How to start export of bookings in .ics feeds from Booking Calendar ? 1) Requirements. This functionality available in the Booking Calendar update 8.0 or newer version. 2) Requirements. Additionally for ability to export bookings into external websites, like Airbnb, Booking.com, HomeAway, TripAdvisor, VRBO, FlipKey and any other calendar that uses .ics format, you will be need to install Booking Manager plugin update 2.0 or newer ( https://wordpress.org/plugins/booking-manager/ ). 3) Export URLs. Now, when you have installed both plugins, you can start configuring of export bookings into external website. Please open the Booking > Settings > Sync > Export -ics page. Configure URLs for each booking resources (in paid versions). In the Booking Calendar Free version, you will see field for configuring URL for your one Default booking resource. Then click on Save changes button. Important! Please note, once you have imported specific .ics feed into external website or application, its does not mean that this operation will be executed periodically. You need to check documentation of specific service (like AirBNB), for ability to import such .ics feeds periodically for having your bookings in external website always up to date. Example of how to import .ics files in Google Calendar. If you get error during generating .ics feed or getting just empty space instead of .ics feed. After this click on icon near specific .ics feed url (check in point #3 in first screenshot point #3), its will open new .ics feed in new browser window. And you have to see .ics feed. Basically in browser window you have to copy full URL and then use it in other services. 2) If you still have an issue. Please recheck your error.log in your server configuration, about any relative errors. If you can not find error.log file, please contact support of your hosting company about helping in finding this file. Just to recheck about the reason of this issue. May be you have not activated some PHP module. 3) Be sure that you are using latest versions of Booking Calendar and Booking Manager. What fields are exported from Booking Calendar to .ics feed? In the paid versions of Booking Calendar possible to define, what exactly field from the booking form to assign to 'SUMMARY' field in the .ics feed. You can define it at the Booking > Settings General page in "Admin panel" section in the option "Booking title (admin panel)"
Booking Calendar export all bookings details (that you have defined as fields at the Booking > Settings > Form page) to this field 'DESCRIPTION' in the .ics feed. Please note, in the paid versions, all such bookings details defined at the "Content of booking fields data" form at the Booking > Settings > Form page.